According to our friend Rep. Jim Jordan (OH-4), Speaker of the House Paul Ryan and his leadership team, including Majority Leader Kevin McCarthy and GOP Whip Steve Scalise, refused to lobby for the Trump-supported Goodlatte immigration bill, which would have built a border wall, enacted E-Verify procedures, and offered DREAMERS a path to citizenship. It failed to pass the House after nearly 20 Ryan loyalists voted against it. Now, many of the 20 Republicans who voted “NO” on Goodlatte are gone, defeated or retired in the 2018 midterm election, and Rep. Goodlatte has been clear on why his bill did not pass, when Republicans had the majority in the House. Our friend Neil Munro reports Rep. Bob Goodlatte, the retiring Chairman of the House Committee on the Judiciary, says the GOP leadership let the House immigration reform die in June by allowing a critical bloc of GOP legislators to split their votes between two rival reform bills. Mr. Goodlatte confirmed that House Speaker Paul Ryan made the decision to create the rival bill that blocked Goodlatte’s bill. On immigration, I really liked—I call it “the Curbelo bill,” it was Goodlatte II — the immigration compromise bill that I put on the floor in July, which satisfied the president’s four pillars. However, the Ryan/Curbelo bill provided the GOP’s business donors with a much higher migrant inflow of cheap worker and extra consumers, compared to the Goodlatte bill. “Our goal is to not cut legal immigration,” Rep. Carlos Curbelo told RollCall.com on June 8. The number of illegals who get green cards from the amnesty should be “as high a number as possible,” he said. On June 13, Curbelo repeated his demand, telling TheHill.com that “some visas may be shifted towards employment visas, but our goal is to not cut legal immigration. Ryan’s support for the Curbelo bill allowed 41 GOP legislators to vote no on the Goodlatte bill when it came up for a June vote. On June 14, the House blocked Goodlatte’s H.R. 4760, the “Securing America’s Future Act,” with a vote tally of 193 to 231. No Democrats voted for the reform. “If it has been the only bill offered, it might have passed,” Goodlatte said. “We were 20, 21 votes short,” said Goodlatte. The [bill] would have passed “if we had gotten half of [the GOP ‘no’ voters] to join with us, we would have gotten there,” he said. The Ryan/Curbelo bill was defeated on June 27 when 112 GOP legislators voted against it. 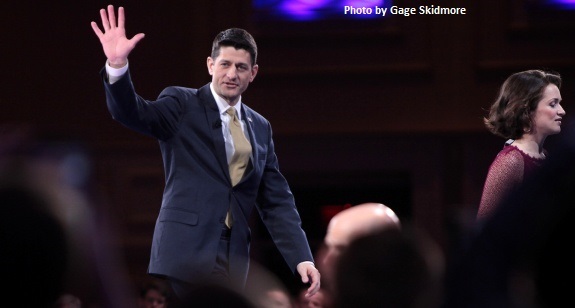 Only 121 GOP legislators voted for Ryan’s bill. However, Ryan’s two-vote strategy successfully blocked the Trump and conservative-backed Goodlatte bill. As we see it, the 2018 midterm election would not have even been close if Paul Ryan and the House Republican leadership had embraced and passed Donald Trump’s conservative immigration agenda. Now, Rep. Curbello is gone, defeated even as Republicans won hard-fought races for Senator and Governor, and the border remains as open as ever, with over 90,000 illegal aliens detained just since the so-called caravan assembled in October. Between now and the end of the year we expect to read many articles in the establishment media about Paul Ryan and tax cuts as his “legacy” as Speaker, but we doubt anyone in the establishment media will write about Ryan’s real legacy – destroying American sovereignty by killing the best chance to pass a strong immigration reform bill and build the wall on our southern border. Submitted by charlyc on Sat, 12/08/2018 - 00:41. Paul Ryan isn't a Republican, he's a RINO - ie, Never Trumper, and has done everything in his power to obstruct and defeat the Trump agenda. He is OWNED by Deep State operatives whose only purpose is to overthrow the United States government. Good job, Paul. You've loyally worked hard at obstructing, but you will NEVER overthrow the United States - the United States will overthrow YOU. Paul Ryan is nothing more than a Globalist prostitute who works for The Man. He has no idea what a Republican is, only what his Pimps require of him. He is the epitome of a RINO. He's never fooled the American people, they know very well who he is, which is why Trump got elected in the first place. To overthrow the RINOs. Submitted by dJ7hsE274U on Fri, 12/07/2018 - 23:42. The last time Ryan functioned as a politician with integrity was when he was in the Wisconsin Legislature. Once he lied his way into Congress claiming to be a conservative he joined other disgraceful Rino's that do more for the liberals than conservatives. He was well trained by John Boehner who was a "make believe Republican" his entire tenure in Congress. Too bad the GOP is too gutless and stupid to do something about these "traitors". Notice the scummy democrat party doesn't have any members called Dino's. They don't put up with that crap. The GOP should be abolished and a new truly conservative party created. Paul Ryan will NOT be missed. But let's see if his hand picked replacement is any better. I won't hold my breath waiting for that. Submitted by xsnake on Fri, 12/07/2018 - 19:09. Rinos went to Washington for themselves and not for America. The next two years are going to be hell. Submitted by email_registrat... on Fri, 12/07/2018 - 13:10. Another great article. It shows once again that the dinosaurs of the Grand Old Politburo would rather lose to Democrats than side with Trump the usurper and outsider. Afterall, the never Trumpers vote no different than the liberals, so why should it matter who controls the House? As Herman Cain loves to repeat: "They think we're stupid." And they really must believe this to think the public does not see how both parties are big governnment and can only be defined by the speed at which they want to impose socialism.